It's long been a fantasy of mine that I would come to participate in a sporting event for the first time and show a natural ability. This fantasy also applies to other things, like singing (that really is a fantasy. I've heard myself sing). Sadly, this fantasy has never become reality-until now! You heard me right. Saturday night, Kevin and I and our friends, Julie and Mitchell, went out to a Learn to Curl clinic and, after a short introduction, played our first game. Half-way through the game our instructor took us aside and told us he has never seen a group with such a natural athleticism for Curling. We thought he was just blowing smoke, but after looking around at the 21 other people playing on the other sheets, he was right. We were much better than all of them! Really. There were people falling over, no stones were making it into the house (the bullseye on the ice) and here we were delivering stones and knocking our opponents out. Now, lest you think the ancient Scottish game of Curling is not a sport, consider the beer drinking. Beer drinking is a common denominator of every sport. And where else is beer drinking the expected outcome of the game? Where else can you call the "Mercy Rule" and the winner will buy you a beer as part of the "brotherhood of Curling"? Now, it's true that I'm not a big beer drinker. Beer is a taste I have not fully acquired, although I have discovered that I do like Labatt's Blue (Ribbon- that's for you, Julie). But what I do like about it is the camaraderie of sitting down to a beer together. It's a lot like having a coffee with a good girlfriend. The clinking together of two bottle necks is something that makes me feel good. Weird, I know. But I digress. Sweeping stones is hard! It's actual exercise. You're running sideways on ice while leaning into a broom and pushing it back and forth in short sweeps. That ain't easy! Delivering a stone out of the hack with the right weight and curl is challenging, especially if you don't want to fall over. You gotta be limber to get down there and your tweaky knee better hold out! Our recruiter- I mean instructor, Rick shared with us the many of the wonderful things in the culture of Curling: Curling is a brotherhood. Before and after each game, the opponents shake hands and wish each other "good curling". There are no officials. It's an honor game, like golf. You call your own fouls. The winner buys the first round. He told us of the friendliness of the members, willingness of curling clubs in other cities to host people in their homes for tournaments called bonspiels, the welcoming of traveling curlers in other clubs. He said that if he was in Canada and his car broke down, he'd call the local Curling club. They'd tow his car, put him up and if he forgot his Curling shoes, would find him some shoes to borrow. He painted a pretty picture. We were feeling like college recruits. I must say, Rick is good in the living room. 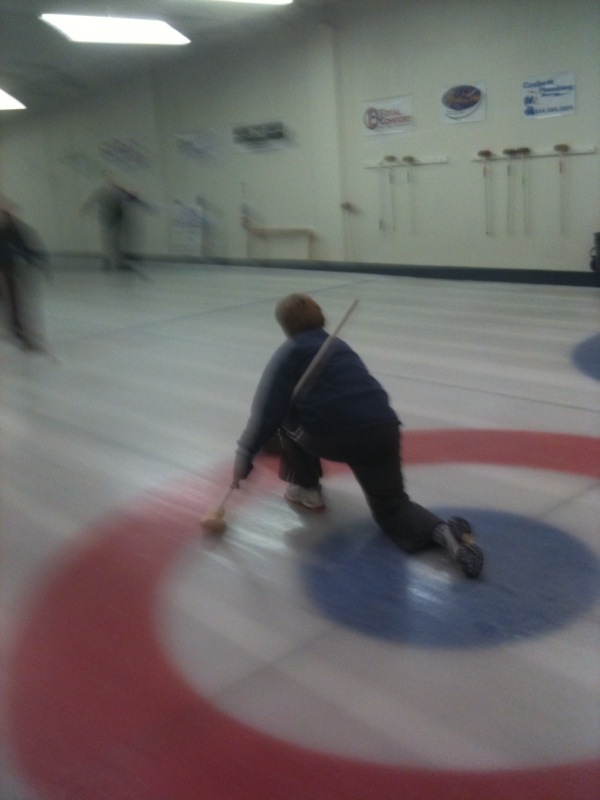 Ever since that day, I've been thinking about curling. I can't get enough. I've even been dreaming of it! I think all 4 of us would like to join the instructional league and learn how to do it better. I think we could be contenders! Sadly, with 7 kids under the age of 9 between us, the day we can do this is at least 5 years away, when the oldest of the kids will be old enough to babysit the younger ones. Oh, well. In the meantime, we've got the 2010 Winter Olympics and a fridge full of beer! Ok, fans of 3 turkeys, (all 3 of you) you've twisted my arm. I humbly accept the challenge of writing on a more regular basis. But what will I write about? Your guess is as good as mine. How about this? I have exactly 5 minutes to write, because it's 2:43pm. Emma just came home from school, Anne-Marie is upstairs talking in her crib (only moments from crying) Andy and Renee are begging for food and I still have to clean myself up, pack a diaper bag for the rest of the day and then we have to go to ballet and straight to Emma's open house after that. Ok? Ok. So, here's what Renee thinks is a good wardrobe choice in the dead of Winter 22 degrees outside and a snow storm approaching: A sun dress layered over a long sleeve t-shirt with sandals. No, pants underneath are out of the question and a coat will ruin the entire ensemble. I have a few minutes to convince her otherwise, because we are about to head out to ballet, but more importantly to Emma's school, where the teachers will suddenly understand that all the notes and questions and letters sent to school are, in fact, written by a crazy woman.